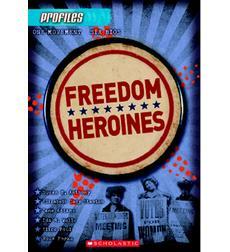 Freedom Heroines by Frieda Wishinsky. Scholastic, 2012. Currently Available. Face Value: I think that this cover is the way that many non-fiction books for young readers have to look now: edgy and cool. Let’s face it: most young people do not read biographies. The cover has to look mysterious enough to attract interest. This is part of a series of biography books, too, so the publisher has to have some consistent cover design. I would love to see the women featured more prominently on this cover, but I also understand that a little subtlety can go a long way when attracting a reader. Does it break the slate? Since all of the women profiled in this book were prominent advocates for human rights, that immediately puts the book in the Slatebreaking category. It is a biography of not just one but of six women who were active in movements for women’s rights and civil rights. I appreciate that the author included profiles of women of color and described the ways in which these women disagreed with one another, even though some of them were fighting for the same cause. Who would we give it to? Any young reader with a budding social conscience will be intrigued by the strategies employed by these women to engage the public in a fight for rights. I think this book is especially relevant as we enter another long stretch of presidential campaigning. I would recommend it to young readers so that they can see where we have been before as a nation. Knowing how hard people fought to have the right to participate in the political process is a powerful antidote to political apathy. Review: The Profiles series from Scholastic is a set of books in which six mini-biographies are grouped into one book. Each book focuses on a specific historical movement or theme. So far the series includes The Civil War, World War II, Tech Titans, and Freedom Heroines. At first I was skeptical about tossing together the bios of six very different women into one book. This volume includes profiles of Susan B. Anthony, Elizabeth Cady Stanton, Jane Addams, Ida B. Wells, Alice Paul, and Rosa Parks. Yes, they may have advocated for similar causes, but would this compact compilation shortchange their accomplishments? Thankfully, author Frieda Wishinsky does a skillful job of weaving together the stories of at least five of the women. Although they lived at different times, their lives did overlap and the women had some interaction with one another thanks to their high-profile work. In the profiles, Wishinsky mentions the ways in which the women met or worked together. She also spends time examining their differing philosophies on suffrage and civil rights. Sometimes their different approaches to the cause made it difficult for them to work together. This was, for me, one of the most important details of the book. Wishinsky carefully outlines the dissent within the women’s suffrage and civil rights movements without pointing any fingers. The reader learns about the factions that formed within each movement and its up to them to decide whether or not these women made the right choices. The only profile that seems slightly out of place is that of Rosa Parks. Rosa’s work is similar in theme to the other women, but the timeline doesn’t overlap as much as the other five. I did love the Parks profile because it delves into Rosa’s long history of advocacy work. She didn’t just blithely choose to keep her seat on a bus one day. It was a strategic choice influenced by years of working with civil rights groups. So often Rosa’s story is whittled down to that one day on the bus, when truly she did much more than that. She is certainly worthy of being profiled, but her story did not interlock as neatly with the stories of the other women. The profiles of all of the women included were thorough and balanced in tone. I learned something new about each woman. The contextual historical information is helpful, too, because it set the tone for why each woman did what she did. The final timeline in the back of the book puts all of these stories together and I also liked this feature because it helped me to see the scope of impact of each woman’s work. For a young reader just beginning to be interested in the history of human rights movements, this is a great book to whet their appetite for more information. This entry was posted in Nonfiction, Reviews and tagged advocacy, Civil Rights, history, suffragettes, voting. Bookmark the permalink.